I have lived in Raleigh all my life, except for when I attended college at Appalachian State University. I graduated with a degree in Child Development and wanted to pursue a career in a field that could help benefit kids’ health and wellbeing. Little did I know that I would come across this amazing opportunity to become a Chiropractic Assistant at Davis Family Chiropractic. I recently became certified as a Chiropractic X-ray Assistant. Outside of work you will either find me hanging out with family and friends or snuggled up on the couch with my cat Marcie. I am so thankful I get to work here with these lovely ladies and I love getting to meet all of our wonderful patients! 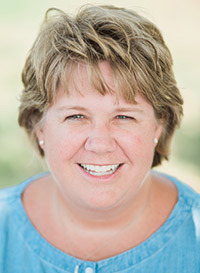 Denise grew up in Trumbull Connecticut before moving to North Carolina in 2016. She is a graduate of Western Connecticut State University with a B.S. degree in Elementary Education with a concentration in Early Childhood Education. Denise went on to teach in the classroom and work in various daycare settings. In 1995, she married her husband J and for the last 18 years has been a stay-at-home mom to her 3 boys, Gary, Griffin and Gregory. Coming from a family of nurses, Denise became very familiar with the healthcare profession via the contact sports of football and lacrosse that all 3 boys enjoy, and the various diagnoses and treatments the boys experienced. After many years of volunteer positions with her children’s school PTOs, Boy Scout Troops and church organizations, she is excited for the opportunity to become a part of the Davis Family Chiropractic team. When she is not working, you can find her spending time with her family including their 4 cats: Vader, Cookie, Panda and Sheldon. She enjoys home decorating, doing anything crafty, and attending her sons’ sporting events. We look forward to meeting you and helping you with all your healthcare needs. Give us a call today at (919) 615-2257!